It has been almost 2 years since we last reviewed a Vision Ears CIEM, that being the VE5 and 6 months beforehand the awesome VE6 XControl which held the top spot in our reviews rankings until 2016. Both of these IEMs took our wholehearted attention for nailing a particular vision of what kind of sound VE wanted to get from each IEM. The VE5 was about vocals, the VE6 XControl was about dual tonalities, one with additional bass and one more neutral combined with unbelievably good staging qualities. Now we have moved on to 2017 and CIEM’s have moved on very quickly indeed both on the driver count side and the technology used. 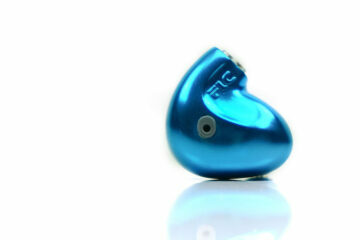 It is perhaps good timing that Vision Ears now release their latest flagship CIEM, the €2.330 VE8. Once again VE gives us a distinct tonal pitch that is in complete contrast to the likes of the neutral and accuracy laden Noble Audio Katana and the similar 64 Audio A18. This particular flagship CIEM is built for outstanding musicality and I just love it. It was all too quiet at VE for a long time so the VE8 is a welcome change of pace and puts the guys back in the spotlight with a brand new flagship CIEM. This is an 8 BA driver design, (with now 7 unique creations in their product line), so whilst it is not the mammoth driver count of say Empire Ears or 64 Audio it does give VE a bit more to play with to create a unique signature of their own. The configuration is unusual for me with 2 for the lows, 2 for the mids and no less for 4 for the treble. Let me just say right away though this is not a treble head tuned monitor, far from it. After all, Noble rocked the house with 9 drivers just recently, as did Custom Art with their Harmony 8.2 which is also just 8 drivers. I say “just” but in reality, in 2017 it is what you do with those drivers now and not how many. It is also their first BA design custom monitor with open back design BA armature drivers. Now, this is not something entirely new to the custom monitor process but it is new to Vision Ears because of the way they specifically fill their acrylic shells with soft transparent material to embed the technical components. It also gives a nice liquid shiny image that makes VE monitors stand out on a design level. The VE8 represents the first time they have been able to use back vented drivers as well as the filler materials to give a superior performance as well as retain the aesthetic “wow”. The VE8 is also being pitched with a new tonal emphasis. This time Vision Ears are going after the audiophile over the musician, which wasn’t the case before with the VE6 or even the unique VE5. In comes musicality over analytical accuracy, in comes better bass quality, more detailed mids and treble and a higher level of instrumental separation from superior phase conformity of the drivers using enhanced frequency separation. The pitch is depth, detail, and musicality with flagship level precision for just about any genre you can throw at it. Rejoice! Vision Ears have a brand new shopping experience and it is bloody good. Not quite at the 64 Audio level just yet since the 64 Audio experience is quite connected from designing, to purchasing, to updates and receiving. 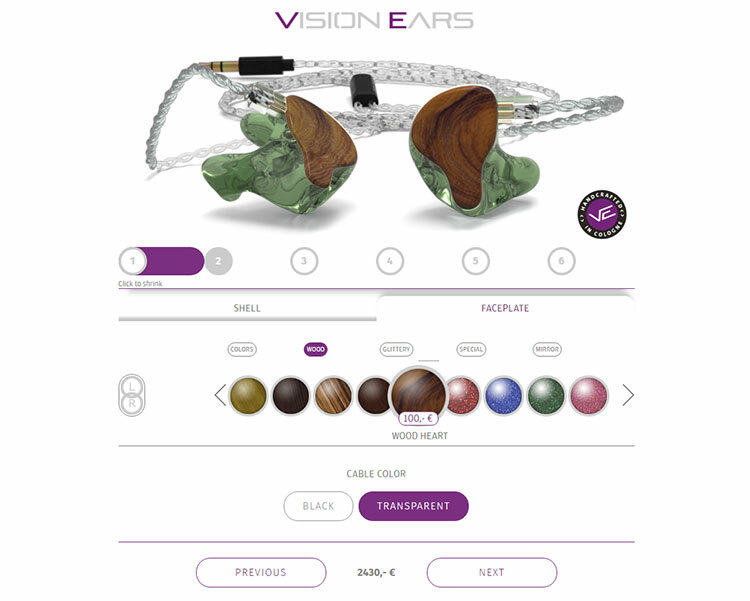 It is also a little bit more user-friendly but Vision Ears has a ton of shell designs in its favor and makes the choosing experience a bit more fun. As CIEM shopping experiences there is now a clear gap back to the rest of the competition. It could well be the number 1 store in time, given the advantage VE has in terms of design choices. Processes can be also be streamlined quickly, artist merit has to be earned and in the case of VE that is a done deal. Before with VE, I had to explain it a little, show them a pic and follow their guidelines via email, chat or whatever. It artificially injected a percentage of possible errors in terms of understanding how the final product should look from both sides. Now the process is almost completely automated from start to finish as well as throwing in an extensive list of accessories just to completely scare your wallet as you waltz through spending alley. The new VE process allows you to pretty much customize all aspects of your new custom monitor and the finally make your purchase all online. 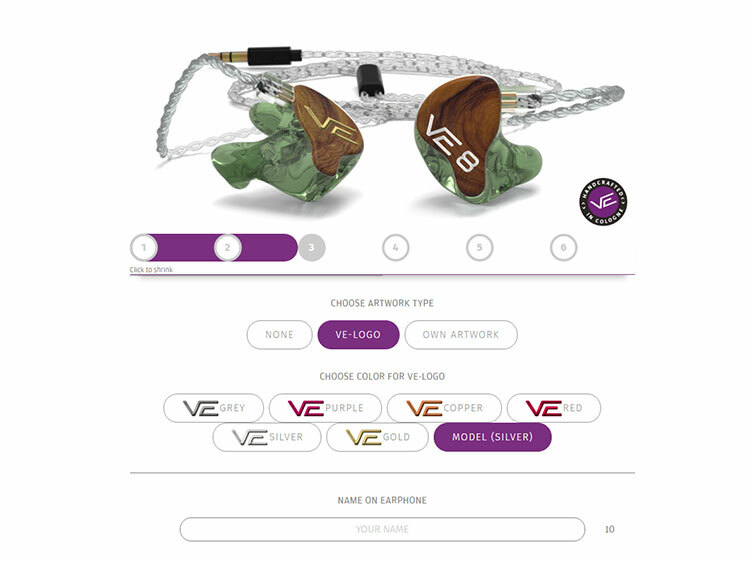 You can choose which CIEM from their range of 7 from the VE2 to the new VE8, customize plates and shells, add accessories, logos and personalize your final CIEM and then create your purchasing and shipping details and pay. 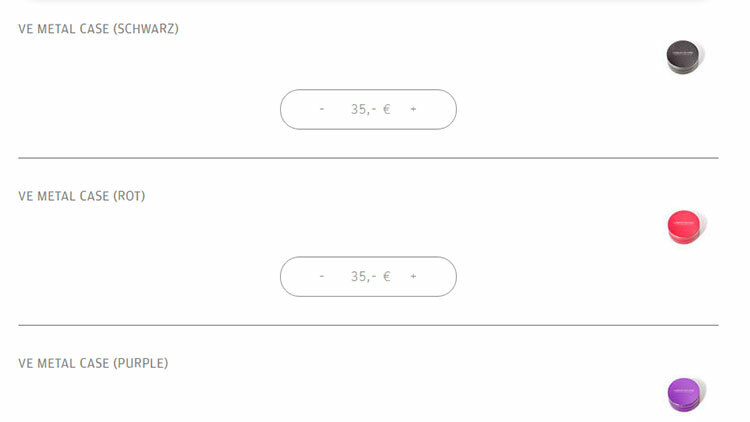 How much you pay is thankfully always present at the bottom of the screen and will change as you add or subtract any additional options that are not standard. You start with 7 CIEM options from the VE2 to the new VE8. Immediately you are presented with a choice of fitting in VE’s unique ambient system in any of their range except the VE6 XControl. From there you start customizing both your faceplate and shell choices. You have no less than 35 shell coloring and design choices. 64 Audio has just 3. You get the drift on the marketing edge right away. The face plate combinations are even more mind boggling with no less than 70 unique designs including wood, mirror, glitter, pearl and translucent/solid color plates. Just lovely. You could literally spend hours mixing and matching and come up with a new design each and every time. Initially, I had some wacky design ideas before Amin came in and said, wait, what about using a design we had thought about before for you? Being about as creative as battery hen farm I quickly yielded. For the shells, we went with translucent olive and for the face plate, we went with one of their new wood plates, wood heart. Heartwood, to give its proper name, is the dead inner wood which often comprises the majority of a tree stem’s cross-section. It is normally found in older trees where there is less of a sapwood mix which has a different color and grain. Cells in the heartwood area are dead cells. The dead cells create residues and compounds tend to give this inner portion of the stem a distinctive darker color with more explosive markings that make samples so unique and eye catching. Beyond that, I gave a free hand with just a limited personalization for my name on the inner part of the shell, the VE8 logo on the front in gold and my name once again on the accompanying hard case. Note at the time of writing, the VE8 moniker in gold is not available in its central location. You can elect for the VE moniker centrally, or the VE8 off center in silver. If the wallet isn’t totally empty you can also use the design tool to top up on additional accessories both in-house and 3rd party including Effect Audio aftermarket cables, quarter jack adapters, pouches, soft cases, and hard cases. You can also grab a few dehumidifier capsules if you happen to live in a jungle like me. Considering this is my 3rd design the days of sending in my impressions have long since gone with Vision Ears able to retain a digital copy of my ear impressions scan. This means it is the same darn fit each and every time and that is really assuring because I love my wide bore designs from VE, very comfortable indeed. Digital scans do save a lot of time and expense in sending in ear impressions and also cut down on the possibility of error from the audiologist side. You simply have to get it right first time. For those who are first timers, I recommend an experienced audiologist using a good quality clay with mild expansion properties and a closed jaw or relaxed mouth ear impression up to the second end of your ear canal. 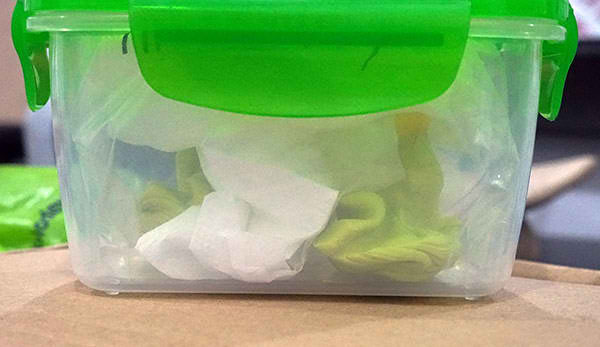 Once completed throw them in a zip-lock bag with a single scrunched tissue, put some air into the zip-lock then close it so the air remains inside. Then pop it in a small food container and give it to your courier of choice for delivery to Vision Ears. Further to my comment above, I have now got my VE8s and I have been trying different cables, thinking I am fine tuning. I was able to listen to a prototype of Effect Audios new palladium coated cable launching in March 2018, and realised that I am not ‘fine’ tuning at all. This cable improves the sound dramatically, in every facet. Don’t take my word for it – try for yourself! Might be worth looking at the Sennheiser IE800s.